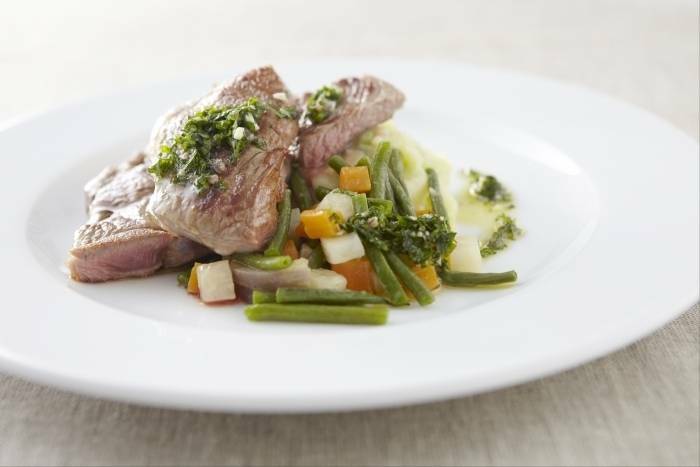 Lamb steak served with mashed potato and savoy cabbage colcannon, glazed carrots, celeriac and green beans finished with a fresh parsley, mint and garlic dressing. For the potatoes: Peel the potatoes and cut into chunks. Place the potatoes in a saucepan of cold salted water. Bring the pan to the boil and then reduce the heat to a simmer. Cook the potatoes until they are tender. Finley slice the spring onions. Whilst the potatoes are cooking warm the double cream, milk and butter. Finely shred the cabbage and add the cabbage to the potatoes 3 minutes before the potatoes are cooked and then drain in a colander. Mash the potatoes in a saucepan and start adding the milk, cream and butter. Add until the colcannon is smooth but not runny. Mix in the spring onions. Season with salt, pepper and some grated nutmeg. For the vegetables: Peel and dice the celeriac and carrots. Top and tail the green beans. Cut the baby turnips in half. Bring a pan of salted water to the boil and cook the carrot and celeriac until tender. Remove the carrots and celeriac and then cook the green beans for 3 minutes. Blanche the baby turnips for 5 minutes and then refresh all of the vegetables in iced or cold water. To glaze the vegetables: Bring the chicken stock to the boil in a wide bottomed pan. Reduce the chicken stock by half until thick and then whisk in the butter. Add the vegetables to warm them through and to coat them in the buttery glaze. Season with sea salt and black pepper. To make the dressing: Chop the mint and parsley leaves. Chop the garlic and anchovies very finely. Mix these with the herbs and olive oil. To cook the lamb: Heat a frying pan until very hot. Season the lamb steaks with salt and pepper. Add a splash of oil to the frying pan and then colour the steaks on both sides. Transfer to a baking tray and finish cooking the lamb in the oven for 5 to 6 minutes. To serve: Reheat the colcannon and fill a stainless steel ring with the colcannon. Spoon some vegetables around the plate. Cut the lamb steak in half on an angle and place on top of the potatoes. Finish the dish with a drizzle of the mint and parsley dressing.